Our Mission is clear: Every day, for every customer, we dedicate the resources and energy necessary to provide unsurpassed quality of products and service. Our engineers and technical support staff with their many years of industry experience will provide you with the information necessary to make a choice that offers the greatest value to your organization. For technical assistance visit our Precision Punch & Tooling contact page. There are a wide range of tool steels and stainless steels that can meet the requirements of virtually every application; the challenge is determining the best steel that will optimize your process performance. Specific applications call for many different qualities in tool steels. These qualities are achieved by adding particular alloy(s) with an appropriate amount of carbon. The alloy(s) in combination with the carbon result in wear, toughness and compressive strength characteristics. Steels vary significantly in hardness, wear resistance and toughness. Wear Resistance = Undesirable degradation of a tool by removal of material from its surface. The wear resistance of tool steel is determined by the heat-treated hardness and the amount and type of hard alloy carbides present in the microstructure. The hardest and therefore most abrasion resistant carbides generally found in tool steels are the vanadium carbides. The primary alloying element that differentiates the wear resistance in traditional high-speed steels is the vanadium content. Toughness is the ability of a material to absorb energy up to the point of failure. Toughness requires strength as well as ductility, which allows a material to deform before fracturing. Compressive Strength = Maximum load a tool can withstand before deforming or failure. There are several alloying elements that affect the overall performance of tool steels. Most critical for compressive strength is the carbon content and the heat treat process. Additional alloys, in specific amounts and ratios, improve hardness, toughness and wear resistance. They are: Molybdenum (toughness), Tungsten (wear resistance), Vanadium (hardness), Chromium (wear and toughness), and Nickel (wear and toughness). To determine the Right Tool Steel for your application, see below. A conventional high-speed steel, hardened and triple tempered to RC: 60-63. It has poor toughness, good wear resistance and high compression strength. An air-hardened tool steel containing 5% chromium. It replaces 01 when safer hardening, better dimensional stability, and increased wear-resistance are required. Good toughness and fair wear resistance. A high carbon-high chromium steel. It has excellent wear resistance and deep hardening properties, and high compressive strength. Fair toughness and good wear resistance. A shock steel with exceptional impact properties and toughness. It is well suited for a wide range of tool and die work. Excellent toughness and poor wear resistance. A powdered metal; a member of the molybdenum-tungsten family of high-speed steels. It utilizes higher carbon and vanadium content to develop excellent abrasion resistance. It is hardened and triple tempered to RC:61-63. Fair toughness and very good wear resistance. Offers a high level of impact resistance with good wear resistance and compressive strength. The name is derived from its almost 3% vanadium content. Very good toughness and good wear resistance. A powder metal tool steel that contains less carbon and vanadium than PM-10V, which results in a lower hardness, slightly lower wear resistance, but a significant increase in toughness. The lower carbon content also enables PM 9V to be used in warm and hot work applications where resistance to thermal fatigue cracking is important. Very good toughness and very good wear resistance. A powder metal tool steel and the most wear resistant material we offer. It is hardened and triple tempered to RC: 61-63 and provides longer tool life than M-2. The name is derived from its almost 10% vanadium content. The good impact toughness is the result of the fine grain size, small carbides, and superior cleanliness of the powder metallurgy microstructure. Good toughness and excellent wear resistance. An oil hardened tool and die steel. It has good abrasion resistance, and sufficient toughness for normal tool and die applications. Fair toughness and good wear resistance. A hot work steel designed to resist abrasion and washing action. It has enough red hardness to retain its properties at high operating temperatures (may reach 1200 degrees F), and where resistance to softening, heat checking and shock are important (has excellent shock resistance). Excellent toughness and fair wear resistance. To determine the Right Stainless Steel for your application, see below. Stainless steels are alloys of iron with a minimum 12% chromium to impart corrosion resistance. To obtain greater corrosion resistance, more chromium is added to the alloy. Stainless steels are uniform in composition. Along with iron and chromium, all stainless steels contain some carbon. The more carbon there is, the more chromium that must be used. Carbon is added for the purpose of making the alloy stronger. Other alloying elements are added for improved corrosion resistance, manufacturability and variations in strength. In the annealed condition it is austenitic, nonmagnetic, extremely tough and ductile, and has excellent corrosion resistance. Improved corrosion resistance over 302. it is also nonmagnetic, tough and ductile. A hardened 12% chrome steel which will resist corrosion from mild atmospheres, fresh water, steam, blood, ammonia, many petroleum products and organic materials, and several mild acid environments. It has high strength at room and elevated temperatures and good toughness for long production runs. This high-carbon, high-chromium martensitic stainless steel is designed to provide stainless steel properties with excellent hardness. It attains a hardness of Rockwell C 56 and maximum toughness when heat-treated. It has sufficient corrosion resistance as annealed to permit its use in mild environments, fresh water, steam, ammonia, many petroleum products and organic materials, and several mild acid environments. This is a high-carbon chromium steel designed to provide stainless steel properties with maximum hardness. This high carbon, high chromium alloy is produced by the electric furnace process and then vacuum degassed to meet the rigid standards of the aircraft industry for bearing applications. This steel develops high hardness and has exceptional resistance wear and abrasion. Standard, Special and Custom Tooling manufactured by Precision Punch & Tooling Corporation are heat treated primarily using Salt Bath processes that are superior to heat treatment using Vacuum and Controlled Atmosphere Furnace processes. By superior, we mean increased wear resistance and toughness under the most severe applications. Precision Punch & Tooling also employs state-of-the-art Vacuum Furnace technology for appropriate applications or when specified by a customer. Molten salt baths are the oldest of the processes used today in the hardening of high-speed tools. Salt still produces the most desirable characteristics producing harder, tougher, finer grained cutting tools, with lower levels of retained austenite. A more uniform temperature distribution and more rapid quench rate are attained in a salt bath in comparison to vacuum quenching. Precision Punch & Tooling optimizes our heat treat process to obtain the optimum combination of hardness and toughness to suit each application. This also allows the removal of virtually all retained austenite by the quenching process and optimizing the tempering temperature and the number of tempering cycles. Retained austenite can result in dimensional changes and harmful residual stresses affecting the life of the tooling. Precision Punch & Tooling has available several Vacuum Furnaces appropriately suited for our customer’s requirements up to and including a 0 bar pressure quench furnace that ensures dense heavy loads can be fully quenched. The convection heating improves cycle time, allows more uniform heating to control distortion and enables clean or bright processing at temperatures of 300F to 1400F. The isothermal quench capability can be used to control distortion and material properties of large pieces. Vacuum processing of tool steels has several advantages. The first is that there are no high temperature oxides formed. The low pressure and high temperature actually reduce the room temperature oxides on the surface so the parts are cleaner when they come out than when they go in. The second advantage is less obvious. Some “protective atmospheres” can cause intergranular attack. This is either in the form of intergranular oxides forming or chemical attack in grain boundaries. Improving the surface finish of a forming punch or tool will increase the life of the punch. This is true whether the punch has a coating added to the base tool steel or not. By improving the surface finish, the likelihood of adhesive wear or galling is greatly reduced. The improved surface finish works on both minimally lubricated or fully flooded drawing or piercing operations by creating an elastohydrodynamic lubrication (EHL) film between contacting sliding surfaces. The lower surface finish will better support a fluid film “h” which will keep contacting steel bodies separated by a very thin film of oil and/or coolant. This lower surface finish will improve the lambda ratio which defines the multiple of the film thickness being generated as a ratio of the composite surface finish of the contacting sliding surfaces. Ideally the lambda ratio would need to be greater than 1.0 to begin full fluid film separation and disallow metal to metal contact. The composite surface finish is defined as the vector sum of the contacting steel surface finishes. Every standard finish tool we produce will have a radial grind orientation to the surface and will meet a surface finish of 9 -14 µin Ra. This surface is deemed adequate for most piercing and forming operations. Our next best surface finish is an improved finish creating a surface finish which will meet a surface finish of 5 – 8 µin Ra. It is a finish which will give increased durability by reducing the opportunity of adhesive wear or galling. Our premium surface finish is a process which creates an isotropic finish which is the ideal combination of the topographical orientation of the punch surface relative to its axis. This surface condition has a random topographical lay and produces surface finishes of 2 – 4 µin Ra. This surface preparation prior to a coating also improves the performance of the coating as the coating will take on the surface topography of the underlying tool surface finish. This finish greatly reduces the adhesive wear or galling and extends the life of the tooling. Wear resistant surface treatments offer great benefit to stamping tools when applied appropriately. While there are many good surface treatments and processes to choose from, Physical Vapor Deposition (PVD) coatings are ideally suited and typically the best option to use on precision slip and press fit punch components. Selecting the right surface treatment and substrate tool steel combination is critical for achieving optimum tool life. PVD coatings provide excellent abrasion and galling resistance while maintaining the integrity of many substrate tool steels. These coatings work best when applied to high speed tool steels such as M-2, PM-M4, and T-15. A few select cold work tool steel grades can also be PVD coated successfully as long as they maintain at least a 60 HRC when tempered at or above 1,000 degrees Fahrenheit. It is important to note that the PVD process is a line of sight process, which may limit the ability to coat interior contours and features. For these applications, nitriding, which case-hardens all exposed surfaces, is recommended. 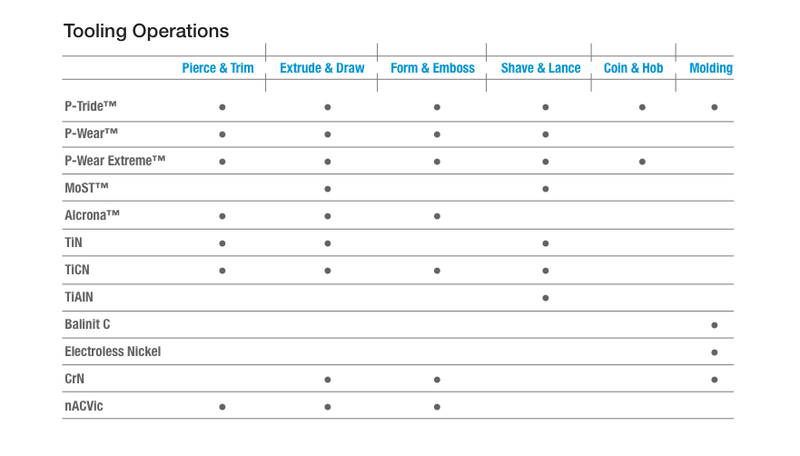 Below is a list of standard surface treatments offered by Precision Punch & Tooling. Additional coatings are available upon request. Titanium nitride was the first general-purpose coating, and the PVD (physical vapor deposition) coating remains an extremely popular and inexpensive choice for wear resistant coatings on cutting tools, punching or forming applications. The TiN treatment provides excellent lubricity and wear resistance on cutting edges and wear surfaces. Works best when used with lubricants. Extreme micro hardness 2300 Vickers*. Adding carbon to a TiN film creates a PVD coating that increases hardness by nearly 80%, resulting in extremely high wear resistance on cutting edges and wear surfaces. TiCN has the broadest range of applications among PVD coatings for enhanced performance and longer tool life. Extremely high micro hardness of 3000 Vickers*. TiCN is recommended for stainless steel, nickel or copper applications. This is the coating of choice for high temperature applications where surface heat is generated. The aluminum in the film converts to aluminum oxide as the coating heats up, resulting in greater protection against shear stress and increased wear resistance on cutting edges. TiAIN coating is often used to protect dies and molds that are operated at high temperatures as in medium and hot forging and extrusion industries. High thermal stability. Extremely high micro hardness of 3400 Vickers*. This case-hardening surface treatment coats and toughens all outer tool surfaces. Its popularity is derived from a large range of effective case applications available at a relatively small cost. Because P-Tride™ case-hardens all exposed surfaces without relying on line of sight (such as with the PVD process), it is extremely effective for coating items such as buttons and tools. Ideal for increasing surface hardness by approximately 10 points HRC. This is a dual-process surface treatment/coating process. By providing an extremely hard coating on top of a less hard but tough surface treatment, load is distributed throughout the tool. This can prevent premature tool failure in applications, such as extracting or forming, where tools endure isolated stress or load on small areas. Provides excellent toughness with high micro hardness of 2300 Vickers*. P-Wear™ is not recommended for use in stainless steel, nickel and copper applications and is most effective when used with lubricants. With the same superior qualities as P-Wear™, this dual-process surface treatment/coating process also offers a greater hardness and lower coefficient of friction, translating into higher wear resistance. Provides excellent micro hardness of 3000 Vickers*. P-Wear Extreme™ is recommended as a superior choice for stainless steel, nickel and copper applications as well as for shaving operations. MoST™ coating provides longer tool life through reduced operating friction and galling. The highly lubricious top layer coat is perfect for stamping of pre-painted material and plated material applications. Provides micro hardness of 2000 Vickers*. MoST™ is especially effective with stainless, HSLA grades, and high tensile strength stainless. MoST™ also offers an additional special heat treatment enhancement process to optimize toughness. MoST™ is a trademark of IonBond® Inc. This multifunctional aluminum and chromium coating is ideal for a very wide variety of high temperature and high strength cutting tools and for punching and forming applications. The treatment creates excellent wear resistance, thermal shock stability and high hot hardness properties. The enhanced performance is due to the advantages of thermal stability, low coefficient of friction, and ductility. Exceptionally low coefficient of friction. Alcrona™ is a trademark of Oerlikon Balzers. This coating has excellent adhesion, high toughness, and good corrosion resistance. Typical applications are metal forming, metal die casting, and plastic injection molding. Approximate hardness is 1800-2100 Vickers*. This coating is used for forming and punching applications for high alloyed materials. The coating offers a low coefficient of friction and therefore offers improved wear resistance. Approximate hardness is 4000 Vickers*. This coating is a WC/C-based coating, and thus a mixture of metal and diamond-like carbon. Results in reduced surface fatigue tribo-oxidation, thereby reducing adhesive wear and good sliding properties due to a low coefficient of friction. Depending on customer application combined with low, medium or high levels of Phosphorous, provides corrosion resistance and offers wear protection. Electroless Nickel PTFE (Teflon) plated in a medium level Phosphorous bath provides lubricity and mold release properties for low-temp injection mold operations. Electroless Nickel Boron provides maximum hardness and self-lubrication for anti-galling properties. In addition to choosing the right steel, right surface treatment and right surface finish as described in previous sections, Punch and Die clearance need to be considered. The clearance between the punch and die is based on many factors such as: material, material hardness, material thickness, and desired finish of the stamped hole or OD of a blank. These factors also have an effect on the anticipated tool life. 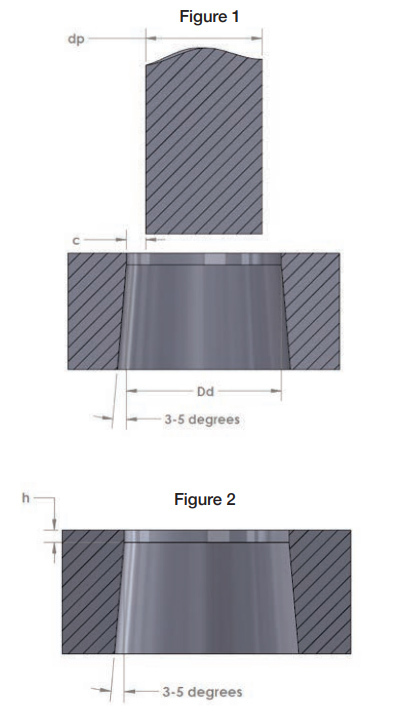 Tighter punch and die clearances will lead to a better-quality piercing in terms of: roll over (minimized), axial depth of the burnished area (maximized), the axial depth of the remaining breakout (minimized), and finally the exit side burr (minimized), but will create higher stresses in the tooling contact surfaces leading to impact spalling, adhesive galling, or abrasive wear. The roll over is caused by the initial entry of the part into the material being pierced and is a result of plastic deformation of the material prior to the commencement of the punch’s cutting action. As the punch enters the material being stamped and the cutting action begins, this creates a burnished annular ring whose depth increases with reduced punch and die clearance. As the burnished annular ring depth increases, the breakout depth decreases. Punch and die clearances are usually called out as a percentage of the material thickness being stamped as well as the material type and hardness. These clearances are traditionally called out per side as illustrated in Figure 1. These formulas are approximations. Punch and die designs can be evaluated using these calculations. It is common to use a factor of safety of 1.3 for the perforating force to account for misalignments, friction, etc. between the punch/die and workpiece. More sophisticated modelling of the actual perforating force can be performed with non-linear FEA (Finite Element Analysis) software packages. 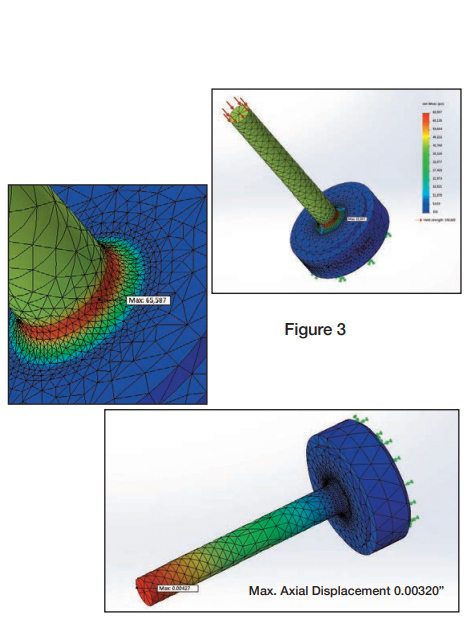 Punch designs which deviate from a constant cross-sectional area should be evaluated using FEA so grooves, fillets, and cross-sectional changes can be evaluated for stress concentration and column buckling (see Figure 3). The aforementioned punch designs can then be evaluated with cumulative damage techniques to predict cycles to failure based on the stress seen in the punch (this excludes any predictive life cycles related to Hertzian contact stress of the cutting edges of the punch).